March 19, 2010: "Integrated Molecular Approaches to Study Microbial Ecology and Evolution in an Acid Mine Drainage-Based Model System." In the harsh acidic environment of mine drainage, without sunlight or oxygen, a community of microbes flourishes. How these microbes affect the mineral deposits, and how those minerals in turn determine the community of microbes, has implications for technologies to develop cleaner carbon-based fuels. A group of scientists, led by University of California-Berkeley's Dr. Jill Banfield, is studying these communities to uncover their secrets. Banfield came to Pacific Northwest National Laboratory's Frontiers in Biological Sciences Seminar Series to present her study of microbes in the harsh environment of mine waste. The series features academic, government, and industrial leaders who discuss novel ideas and scientific advances in biological sciences. 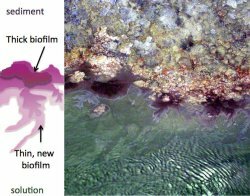 The biofilms studied are delicate structures of microbes attached to mineral formations and each other, extending out over thin pools of water below ground. Metagenomics, the study of genetic material sampled from the environment, was used to develop profiles of these unique microbial communities. Using Sanger DNA sequencing, researchers obtained well-binned datasets that gave them a sense of the completeness of the genomes from their samples. In part, this completeness is because the low diversity of microbes in these communities enabled comprehensive sampling; and, in part because of the high level of curation of the genomes by Banfield's group. From these data, Banfield and her colleagues studied the ecological succession, profiling the types of chemical and biological interactions taking place in the system. Once the genetics were profiled, researchers worked to identify the proteins. Proteomes—sets of proteins found in genomes—were compared in the sampled communities. When the data were clustered, two distinct groups emerged. For the dominant community member, proteomic patterns were correlated to community membership. For the lower abundance organisms, proteomes were linked to specific environmental conditions, such as temperature, pH, and metal concentrations. Metabolomic signatures, like a kind of chemical fingerprint, were found to correlate with specific members, providing clues to biochemical optimization that may be required for niche differentiation (the process by which natural selection drives competing species into different patterns of resource use or different niches). Understanding how these microbes thrive and respond to changing community membership and altered geochemical conditions will be used to build a carbon cycle model that includes aerobic and anaerobic components. 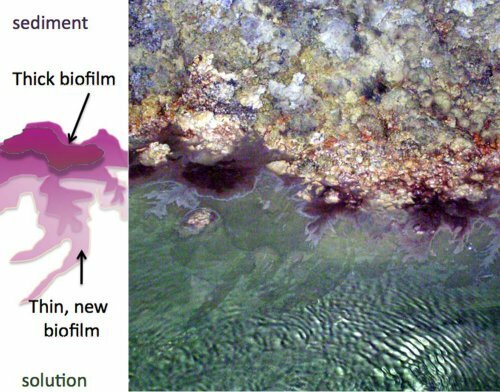 The acid mine drainage biofilms provide a model community system for developing methods to resolve carbon cycling at an unprecedented high level of resolution. Understanding the microbiology in this environment has potential to promote energy-efficient metal recovery and sulfur and mercury removal from coal. The integrated culture-independent "omics" methods developed through these studies can have broad application in studies that ultimately reduce greenhouse gas emissions in energy production. About the research: Funding for this research was provided by the U.S. Department of Energy's Genomics Science Program. The research team included Dr. Trent Northern and Dr. Ben Bowen of Lawrence Berkeley National Laboratory, and Dr. Bob L. Hettich and Nathan C. Verberkmoes of Oak Ridge National Laboratory. About the speaker: Dr. Banfield is a professor in the department of Earth and Planetary Science and Environmental Science, Policy, Management at the University of California Berkeley. She is also a researcher at Lawrence Berkeley National Laboratory. Dr. Banfield received her undergraduate and MS degrees at the Australian National University, and a PhD from Johns Hopkins University. She is the recipient of numerous fellowships and awards from organizations such as the John D. and Catherine T. MacArthur Foundation and the John Simon Guggenheim Foundation. She is a member of the National Academy of Sciences and served on its Board on Earth Sciences and Resources and served on numerous committees of the Mineralogical Society of America. She has published over 200 papers in mineralogy, chemical, and geomicrobiology journals.